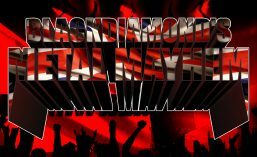 Blackdiamond’s Metal Mayhem on Tuesday 22nd January will be as always from 6PM GMT for two hours on http://www.totalrock.com. The show will be premiering three awesome new tracks from the soon to be released album by MY PROPANE, titled “Antidote”. The album will be released this Friday via Darkside Records, don’t miss it! Also coming up, the latest from OVERKILL, HATH, HEAVENWOOD, DEEVER, BATTLE BEAST, LAVIDIUS, HELEVORN and HELLNITE, plus plenty more! The META(L)SCOPE will highlight three tracks by US metallers SEASONS OF THE WOLF, from their album “Last Act Of Defiance”. This entry was posted in Radio Shows and tagged "Antidote", "Last Act Of Defiance", Blackdiamond's Metal Mayhem, META(L)SCOPE, My Propane, Seasons Of The Wolf, TotalRock. Bookmark the permalink.